Most of you know I am constantly working toward simplifying my life. Adding systems, de-cluttering, organizing, tossing stuff, etc, in order to make my life less complicated and easier to handle. The area in my life that I think I have excelled in this the best so far, is meal planning, prepping, and cooking. I love eating food, a lot of it, and have found recipes that have made my life simple and easy when it comes to time in the kitchen! I wanted to share with you some of the things that have worked for me! To start off, in order for any planning, prepping, organizing, etc to work, you have to be willing to make time for it. I am fortunate because I work from home, so I can make things that take a long time to cook (and by long time I mean 30 minutes) while I am working! IMPORTANT NOTE: If you choose to do this, set a timer on your phone (not the stove in case you leave the kitchen) for when to check on stuff. I have learned the hard way, several times, that it’s super easy to get distracted and forget what you are doing on the stove, and end up with eggs exploded all over the kitchen ceiling (pre-vegan) and a pan melted into the stove, and smoke filling the house. My bad! Even if you don’t work at home, you can find time to prep things that take time to cook. While watching TV, while helping the kids with homework, while you are doing your exercise video (I mean streaming), while you are taking a shower and primping, while you are walking the dogs (short walk only in this case), etc. If something is important to you, you will find time for it! 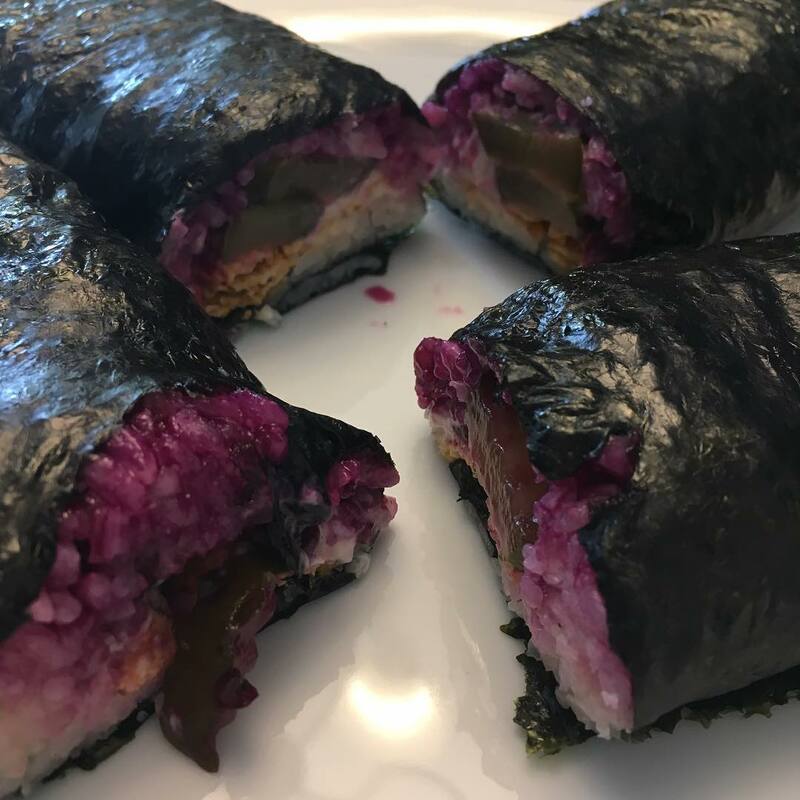 I love making a giant pan of Sushi Rice because it is simple, inexpensive, and can be made into sushi burritos, sushi rolls, stir-fry, any rice dishes, or even eaten plain. 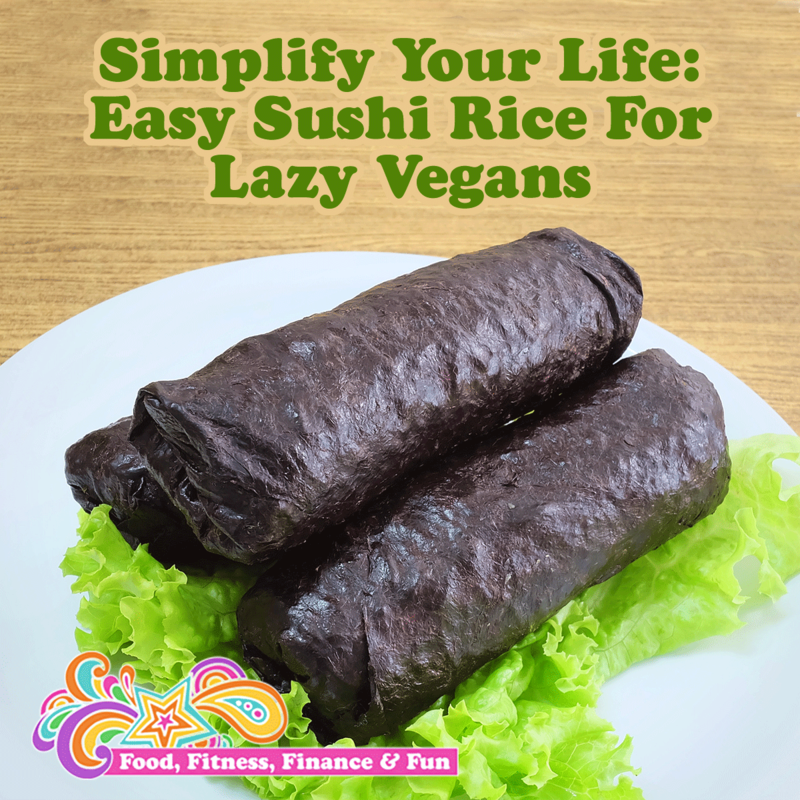 You can make sushi rolls out of any fruits, veggies, etc that you have laying around the house or that you like to eat so it is quick and convenient to have handy. It also makes for a sweet/salty treat for after dinner or after a long workout. It’s versatile and something the whole family can enjoy. It’s healthy and can be eaten warm or cold. I make a double batch to save on time and have more available for me, so if you won’t be going through that much, make a single batch. When you are 5 minutes away from rice completion, begin making the sauce. In a saucepan, bring to a boil ½ c of rice vinegar, ½ c of maple syrup, and 1 tbsp of salt. Once everything is dissolved together (about 1 minute of boiling and stirring), pour the liquid into the rice and stir. You can eat it immediately if you want to make it into something warm (or eat plain) or you can cool it and store it for later use. I store mine with a lid on the counter because I like it to stay soft (sometimes rice in the fridge gets hard) and have stored it up to 2 weeks. I love eating it plain! For meals I usually take a seaweed wrap (nori paper) and lay a thin layer of rice on top, spread vegan mayo on top of the rice, and then add whatever veggies I have or want. My fave is bread and butter pickles and pickles beets with minced garlic and ginger. I wrap it all up into a “burrito” and eat! I would love to hear your fave uses for Sushi Rice and other super simple kitchen hacks that have worked for you!